reesasworld: Pitaya and loquat pie? Israeli farmers grow approximately seven times as many fruits and vegetables today as they did 25 years ago without an appreciable increase in water usage. The lack of rain in Israel has, of necessity, led to technological advances in agriculture that have changed the world. The drip irrigation system was developed in Kibbutz Hatzerim (about 10 minutes – with traffic – from my house), and today is sold all around the world. It has revolutionized agriculture, not only in Israel, but in Africa, the Western United States and South America. They sell their technology to 112 countries. But saving water through irrigation is just one way to save water. Israeli researchers are on the cutting edge in the use of recycled water. Israel has produced fruits and vegetables that need less water. Israel has developed methods of growing more food in a smaller area of land, thus saving both land and water. A dunam of land in Israel (approximately a quarter of an acre) can yield more than 30 times as much food as in an average agricultural country. Altogether, more than 40 different kinds of fruits are grown here, and Israel leads in citrus production and is second, after Japan, in the production of loquats. There’s another fun fact to take to your friends. Israeli agronomists are also busy developing new and improved fruit. Researchers are now creating a new strain of prickly pears (aka sabra fruit), without the prickles. Not as much fun, perhaps, but a lot easier to eat. Now if we could only grow sabra people without the prickles. Growing fruits and vegetables that are indigenous to the region or easily adaptable to the Israeli soil and climate is no longer a challenge. Researchers have been busy bringing new species to the country and adapting them to their new home. Berries that need a cool climate have learned to love the heat. Where once blueberries and blackberries were only a faint memory of the 'old country', now they are available in many moshavim in the Golan and in Gush Etzion. Fruits that require huge amounts of water, no longer do. 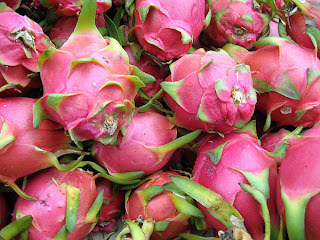 Native to the jungles of South America, the pitaya (also known as dragon-fruit) was brought to Vietnam in the early 20th century and now grows across central Asia. These being tropical lands with large amounts of rainfall, it didn’t seem possible to adapt the fruit to the desert of Israel. Yet, not only is the fruit being grown commercially in Israel, with exports of 30-50 tons a year, mostly to Europe, it tastes better than its Asian cousins. And needs a lot less water. I am privileged to have gotten to know Prof. Yossi Mizrachi of Ben-Gurion University in the Negev, who was the principal researcher who adapted the pitaya fruit to Israel. He worked in an office down the hall from mine. Once, he took me and two colleagues on a short tour of his hot houses where his pitayas grew in pots. Not only do the pots greatly lessen insect infestation of the tree and lower water loss but, Yossi gleefully informed me, they also makes the pitaya kosher in a shmita year. Only in Israel, would that be a concern.